Do you find your constantly self logging into Flurry.com from your desktop/laptop to see the latest statistics about your Apps? 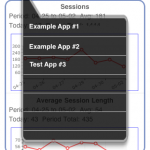 Ever wish you could see a graphical representation of your Apps performance right on your iPhone or iPad? 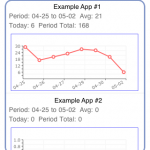 AppTrack provides you with both statistics and graphs that illustrate your apps performance. AppTrack is a data visualization tool that interfaces with Flurry.com extracting out the information that you need most, and provides a simple, easy to use view of your data. AppTrack will automatically recognize when new applications are being monitored by your Flurry.com account and will automatically update with the new apps. Flurry.com uses a flash interface for all of its graphics and data, making it almost impossible to track your applications using their website. 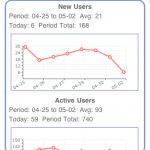 Stay on top of all your key app statistics with AppTrack.